Wow. Phew! Happy days. Big smiles. Big birds. Big fears. Even bigger oceans. Lots of tears:of happiness and of sadness. Salty. Very, very blue and ever so slightly chocolatey. Amazing. I know that the ‘a’ word is used too much these days, but I feel that it warrants inclusion in my list of words for summing up 2009 and the decade that it rounds off. Reflecting on the last three and half years since Dad died and I decided to embark on my Indian Ocean voyage in his memory, I see pain, struggles and salt water. I still find it quite hard to take in. There were so many tough times, contrary currents and troughs of despair in these two monumental journeys which make up the biggest challenges of my life. But I look at the progress too, and see that my family and I have survived and made it some way down our crazy grief roads, and Dippers and I have traced a wiggly line across an ocean. 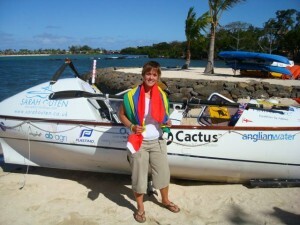 I have also been priveleged to be able to share the adventure; in the last month alone have rowed both oceans again and again with thousands of people. Who would have thought? I also see all the lovely folk who have helped me along the way and been a part of my team; my dear and lovely Dippers rocking gently in a bright infinity blue or surfing down the waves with my Tweedles swimming along beside; happy socks and chocolate on a cabin day; an albatross cruising on the waves at stage left; the iodine stains from where I lost the lid while dousing the ‘lower deck’. I see Bob tucked away in the cabin and I smile proudly at my faded ragged ensign flying gently in the breeze. Thankfully there is no mush in sight, but instead I am toasting the day with a slug of Port from my Little Miss Chatterbox mug. My hair is salty, my face yellow with zinc cream and I am as happy as a Tweedle on a summer’s day. The sun is setting – bright red and fiery to the one side with aubergine blue skies on the other showing the first starry signs of night. I know that Orion and his mates will soon arrive to stand sentry. It is beautiful and awesome, quite literally filling me with awe. I am at peace and in harmony with the world. It is raw and elemental – just as adventure should be. This is the picture show which helps make up my take-home memories of the decade, indeed of my life now. They will nestle between many more great memories of adventures out on the open ocean; of my right-hand man Ricardo; of those first hugs in Mauritius and the crazy post-ocean wobbling of my early months back on land. My lovely Dad is there too – smiling and probably chuckling, and no doubt shaking his head in amused disbelief at my next project. ‘And what is this next project?’ I hear you say. Well, for this you will have to wait until 2010. For now, I would like to thank you from the bottom of my salty heart and my lovely boat, for all your support in helping me make these journeys through all this salt water – of oceans and tears, of grief and adventure. Great work, team. Here’s wishing you all the salty best for a happy and healthy 2010 and beyond. Sarah. Wow that was some email—very special. It is us who are thanking you,not the other way round. We are so privileged to have shared it with you daily on your incredible journey. Thanks for enabling me to experience secondhand your great adventure in 2009. I can still see you setting out (the second time) from the RPYC annex in Fremantle that sunny, blue morning. Wishing you and your family a very happy Christmas and New Year. Happy Christmas Sarah and all the very best wishes for 2010 from the Hamp Family in sunny Perth. Hoping to see you here again next year? Merry xmas and a bright new year. Hope to see you in Mauritius soon. Happy Christmas Sarah and all good wishes for you, your family and your team in 2010.
hi sarah,hope you and yours have a fantastic festive season and new year,just really wanted to say thank you for sharing your amazing adventure with us all,as much as you might have drawn inspiration and support from those of us who followed you equally i believe that you have been a tremendous inspiration to us also. the extent of your pluck and determination really did light up the year for me,i was often scared for you but somehow knew you’d get through with dependeble dippers to assist! anyhoo,whatever you have planned for 2010 we’ll all be along for the ride and meanwhile just have a blast! what a crazy year you have had! special thoughts all the time .you are so postive when you go through your ventures .best of all you always share it with us. To wish you Sarah,Dippers,Bob and all of you bloggers, that journeyed along with me during this amazing row across the Indian …. I would love to have been able to talk about the journey that I and the other M.O.O.R.’s ~ Mother’s of Ocean Rower’s took too!!! It was a very special journey, we made it too. We all achieved more than we realised we could. Sarah have a brilliant Christmas and New Year ~ love to all the family. It is often after the event, that we best appreciate the event. And you made it happen!! I love your spirit, dedication, drive and love for life! Xtina – maybe you would like to write a post sometime on the journey by a mother of wanderlusting nutters?! WA – I am hoping to come back in Aug/Sept 2010. Watch this space. Happy Christmas, and a prosperous and fun new year! Who knows where the next decade will take you? It was lovely to meet you in the summer. PS Thanks for another wonderful blog entry! Good to hear from you again. Hope you had a great Christmas Sarah & all of us here at CLASH in Birstall wish you the very best for 2010. …Your lovely Dad probably chuckling, and no doubt shaking his head in amused disbelief at my next project – what lies ahead for you in the New Year we wonder…? Wherever your travels take you, everyone with arthritis will continue to be reminded of the courage you showed during the journey you made in memory of your Dad to raise funds & the wider public awareness of the condition. Hope we manage to get to see you before you cast off again. An AMAZING, AMAZING year. We followed your progress, & you made the year for us – SUPER achievement!!!!!! We love you lots!!!! Hope we will meet sometime. Hope you had a a fantastic NEW YEAR. Take Care TERRY B !!!!!!!!! !